QUAC (Quick Atmospheric Correction) is a rapid, empirical atmospheric correction code that uses in-scene information for hyperspectral and multispectral imagery. To use QUAC, no knowledge of sensor metadata is required, the sensor does not need to be radiometrically calibrated, and automated batch operation is supported. While first-principles codes such as FLAASH® remain the most accurate software for well-calibrated sensors and clear atmospheric conditions, QUAC can be superior under stress conditions such as thick haze or smoke, under cloud cover, or for long slant paths. QUAC is paired with FLAASH in the Atmospheric Correction Module (ACM) for ENVI, the popular and powerful image visualization and processing software by Exelis Visual Information Solutions. QUAC is also available from SSI as a standalone C++ code ready for integration into batch data processing systems. Licensing or Purchase: To purchase the ENVI Atmospheric Correction Module (ACM), please visit the Harris Geospatial Solutions website. For licensing the ENVI ACM by the month, please visit the CloudEO Store. 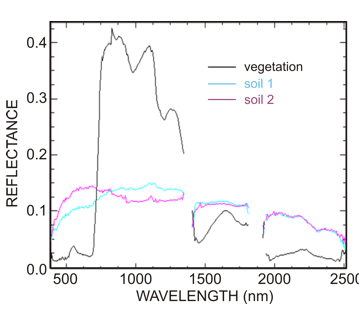 The figure shows the QUAC-generated reflectance spectra of surface materials.